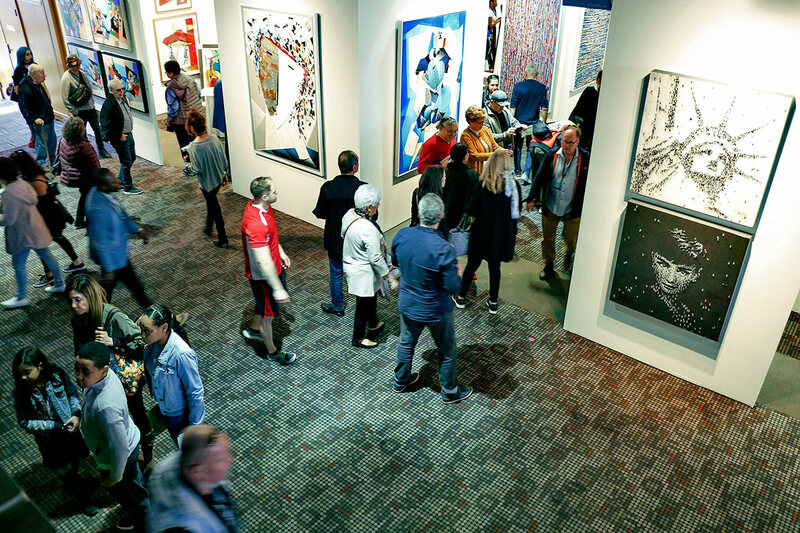 Artexpo New York, the world’s largest fine art marketplace and longest running contemporary art show, began its fifth decade in a new location at Pier 90 in the heart of Midtown Manhattan, April 4–7, 2019. This year’s fair hosted more than 300 innovative exhibiting galleries, art publishers, and artists from 62 countries across the globe, showcasing original work of 1000+ artists, including prints, paintings, drawings, sculptures, photography, ceramics, giclees, lithographs and glass works, among other contemporary and fine art. With an 11 percent increase in traffic on Thursday’s Trade Day and a 5 percent increase in collectors over the four day event, it was clear that Artexpo New York continues to be one of the country’s most electrifying art expositions. Engaging exhibitors and attendees alike with the curatorial [TRANSFORM] – Artexpo examined the power of art, how it challenges the status quo, changes our perceptions, and pushes us to see ourselves and others from a new perspective. Through its power, art transforms. Throughout its four historic decades in contemporary and fine art, Artexpo New York has hosted the likes of Andy Warhol, Robert Rauschenberg, Keith Haring and Leroy Neiman; intensifying the discourse on today’s industry challenges and magnifying the very best the fine art world has to offer. In addition to visiting the world’s largest fine art trade show, more than 35,000 avid art enthusiasts and industry leaders flocked to experience the annual fine art destination and its Three Shows Within One Venue, enjoying [SOLO] highlighting established and independent emerging artists and [FOTO SOLO] featuring fine art photography from some of the world’s finest abstract, contemporary and realist photographers. Aimed not to disappoint, Artexpo’s iconic programming once again caught the attention of fair goers and media alike. Anna Voloshko Sculptures — The quirky and unique bronze sculptures of Anna Voloshko lift the heart and touch the soul. Josy Britton Fine Art — Britton’s encaustic paintings will change the way you see when you walk a forest trail or travel a river. [Kun:st] International — Based in Leonberg, Germany, the nonprofit international art association brought the works of Anja Struck, Betty Schmidt, and Suzanne Kolmeder to the show. New York Center for Photographic Art — NYC4PA provides exhibition opportunities to fellow photographers worldwide, featuring artists Patricia Giman, Maddi Ring, Annette Schreiber, Douglas Collins, and others. Peace Waters Fine Art — Inspired by spirit and nature, Shima Shanti paints with beeswax and fire to create her encaustic works. Acute observation and reproduction techniques imbue Mike Clark’s representational realism still lifes and landscapes. Attendees once again enjoyed an extensive Meet the Artists program of activity during the four days of Artexpo New York, which included live demonstrations in each exhibition booth by the artists themselves. This year’s Education Program included an extensive series of 20+ Topics & Trends seminars, moderated panel discussions and Art Talks, presented by today’s most influential pioneers from the arts industry. Some of the most popular subjects were Trending In Today’s Art World, Success Secrets of Amazing Fine Art Photographers, Origins of Inspiration, Artist Fame and Fortune: Turning What You Love Into A Viable Career, Choosing A Career In The Arts, and Art Law Primer: Art Licensing. The very popular Rising Artist Gallery, showcased more than 35 emerging artists of tomorrow, many who placed their artworks, took commissions, and had gallery opportunities presented to them, including Rising Artist Award winner Oksana Izbyanska who captured collectors’ attention with her innovative style and sold three pieces, i25 Million Miles to the Sun, Good Vibes Only, and B&W Story #5,took a commission, and has over 50 new interested collectors. At this year’s show, exhibitor Artrates presented Japan’s most famous comedian “Cookie” in a Meet the Artist session, delighting show goers and Japanese media outlets, including FNN TV coming all the way from Japan, to be a part of his U.S. artistic debut. With the aisle crowded, “Cookie” and his novel artwork became one of the many highlights of the fair. Samir Sammoun of Sammoun Fine Art – an Artexpo New York exhibitor for more than 20 years – success began on Thursday’s Trade Day and continued throughout the show, placing more than a dozen of his original oils with prices ranging from $10,950 to $35,000, including Wheat Field, Bekka Valley; Spring, Central Park; Peuplier au Bord de la Mediteranean; White Note 1; and Olivers. Smart Publishing/Blue Gallery placed multiple paintings and several sculptures at prices undisclosed. As expected, returning exhibitor Deljou Art Group’s booth was busy from hour one to the very end of the show. Craig Alan’s originals were in high demand, placing Moonlight Saunter, Underdog, Altered Reality and Populous Soup from the Populous Series among many others at $8,900, $11,000, and $12,900 respectively; as were pieces from artist Srinjoy’s Anoram collection at $4,050 to $5,400; Devyn Yeager’s Dreaming in Colorseries at $6,500 to $7,500; Cecil K’s Garden Delight at $6,600; Mia Stone’s Paleo Floral and Songs at $6,200 and $9,250; Torabi’s Life in Motion at $9,250; Lun Tse’s Streaming at $7,050, among many others. Jbis Contemporary Art and artists Jeffrey and Michael Basillon’s POP Collection proved to be exceptional placing 10 pieces the first day, including Inspire, James, Liz, VJDay, Ali and Blondes, each for $7,000. And by the end of the show, Jbis was sold out, claimed two new galleries and cemented a corporate art licensing deal. Mattson’s Fine Art were excited to report multiple successes for their artists, including Alexis Silk’s ever popular glass sculptures, placing 15+ pieces in both onsite sales and multiple commissions, with prices ranging from $2,500 to $8,000 and above for several of the commissioned pieces. Two more sold out booths were reported by Anita Lewis, who’s sales included Silver Rose, Ancient Waters, and Neptune’s Gold with prices from $4,900 to $6,100; and first time [SOLO] exhibitor Bill Tansey, who placed more than 14 of his contemporary florals, ranging from $1,075 to $2,550. First-timer Jackie Fuchs also had a great show, nearly selling out with more than 12 pieces of her recognizable mixed media pieces placed, including her newest piece painted onsite, ranging from $1,400 to $8,800. 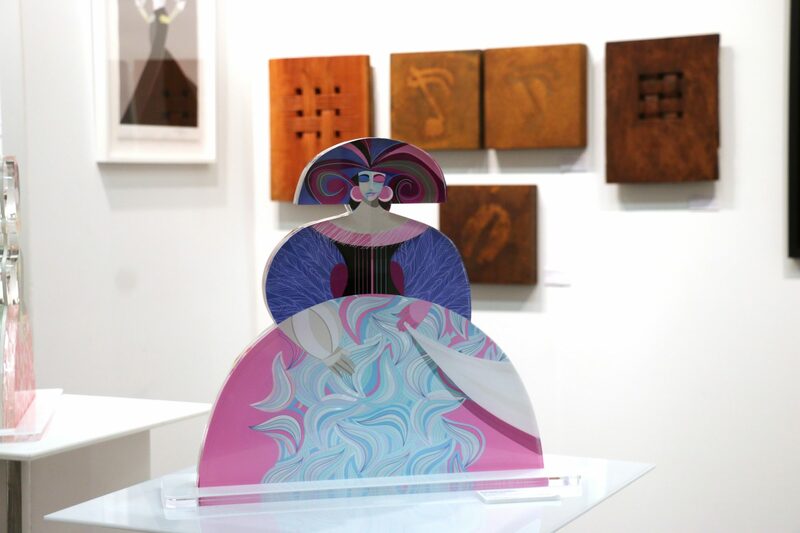 Anna Art Publishing, featuring artist Anna Razumovskaya, had another productive Artexpo show selling dozens of pieces of her signature romantic style works, including her newest sculpture collection, with sales ranging from $1,980 to $40,000. and above. Artblend celebrated its eighth year at Artexpo and reported is being the best show they have ever had, selling works from multiple artists, including Christine Alfrey, Jim McCormick, RoxySora, and others. Innovative glass artist Nick Leonoff was pleased to have placed more than 9 pieces of his Biomorphic Portal and Portal Series, ranging in price from $2,800 to $8,000, plus taking several commissions for special request pieces. Lights, Camera, Action, The Media Buzzed! This year’s Artexpo New York captured the attention of major media outlets in New York and beyond, with coverage including onsite coverage by Japan’s FNN TV, a shout-out in NYCultureBeat, artist Cookie’s story in VICE, an interview about the show in My Modern Met, Filipina artist Sal Ponce Enrile’s exhibit was covered by Inquirer USA, and many others. We also reached more than 150,000 fans via social media, offering followers around the world up-to-the-minute event tidbits and photos on Facebook, Twitter, and Instagram. Thanks to everyone liking and following us on our social media channels—we love keeping you engaged! And last but not least be sure to check out all the video highlights from this year’s show here. Whether you see Artexpo New York as the place to grow your business or the place to be discovered, your exhibition will definitely give galleries, trade buyers, and art collectors from all over the world the chance to see what you can do. Returning to Artexpo after exhibiting this year or inspired by this year’s event and want to give exhibiting a shot yourself? Don’t wait to apply as prime space is already filling up. Apply for 2020 here—or contact our Sales team—we’re here to help you. We would like to extend a huge thank you to the countless exhibitors, collectors, galleries, and artists who played a part in Artexpo New York 2019. We would also like to thank our sponsors for making this year’s event one of the best. We are looking forward to seeing you again next year for Artexpo New York, back at Pier 94!